Remove packaging, mix all ingredients with 250 ml boiling hot water. Stir well and serve immediately. Allergy Advice: Contains Soya Bean, Fish. This product may also contain wheat and gluten and traces of nuts and/or seeds. 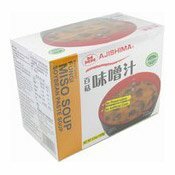 Ingredients: Soya Bean Paste (Soya Bean, Rice, Salt), Mushroom (30%) (Winter Mushroom, Oyster Mushroom, Tea Tree Mushroom, Beech Mushroom, Shiitake Mushroom, King Mushroom), Bonito (Fish) (0.5%), Sugar, Hydrolysed Soya, Protein, Yeast Extract, Flavour Enhancer (E631).